Can you imagine being arrested on a minor charge, stripped naked and put into a solitary jail cell for a week with nothing in it? Can you imagine being slapped in the head by a corrections officer because you didn’t comply with an order that you didn’t understand? Can you image having five men dressed like Ninja warriors wearing football-like helmets with visors attempting to violently tie you to a chair? Can you imagine voltage from a Taser being shot into your body not once, not twice, not three times, but four times until your body goes into cardiac arrest? Can you imagine being rushed by EMTs to a hospital where your urine soaked body looks so horrific that the emergency room crew is sickened by what they witness? This is not some tale of torture filtering from Abu Ghraib prison. All of this happened last week here in Fairfax County, Virginia, a wealthy suburb of Washington D.C. where elected officials have stuck their heads in the sand when it comes to facing what now is being revealed as our grim reality. The unnecessary death of Natasha McKenna, a 37-year-old African American woman being held at the Fairfax County Adult Detention Center is the newest example of why persons with obvious mental disorders should not be incarcerated when charged with minor crimes, but instead be diverted into treatment programs. Here is what I have been able to learn about McKenna’s death. She was charged in Alexandria in late January with simple assault — a charge so minor she was not arrested on the spot. She was picked up by Fairfax police as a courtesy and taken to the Fairfax jail. It was clear from her arrival that she was clearly psychotic and a quick check of her history showed that she had been hospitalized previously for mental problems. She was not some hardened criminal or gang member. She was sick. Because she was psychotic, McKenna was put in an isolation cell away from other prisoners. She spent a week there waiting for Alexandria officials to come and get her. During this time, she turned violent, kicking, biting and spitting at officers. She was left alone inside four walls with nothing except an occasional check by jail officials. There was no outside recreation, not meals with others, only isolation. At one point a deputy physically slapped McKenna in her head with his hand during a confrontation when she didn’t comply with an order. McKenna became such a problem that officials at the jail decided last Tuesday, February 3rd, that they would stop waiting for Alexandria to come get her and take her there themselves. That morning, a veteran deputy informed McKenna that she was going to be transferred. McKenna asked if she was going to be hurt by the deputies, an apparent reference to being slapped in the head earlier. He assured her that if she cooperated she would not be hurt. Remember this was a small woman being held on a minor charge. When McKenna stepped handcuffed from her cell, the Sheriff’s Emergency Response Team (SERT) took charge. The SERT team is meant to look and be intimidating. Its members are dressed in black, wear padded vests, football style helmets with visors and by training enter a cell in a straight line with the lead officer using a clear shield to protect him. His job is to use that shield as a battering ram to knock down a dangerous inmate while the four officers behind the leader each grab a specific arm or leg to immobilize a prisoner. SERT is used on the worse of the worse inmates. As soon as SERT took charge, McKenna began to resist. All of this was being video-taped, which is standard procedure when a SERT Team is called because SERT extractions are generally violent and deputies want evidence to show that they acted professionally. What that video tape shows is a SERT Team struggling to force a hostile McKenna into a metal restraint chair where her legs and arms could be tied down. This is where she was shot with a Taser, not once but at least four times. McKenna went into cardiac arrest. When EMTs arrived, they found a heartbeat and resuscitated her while en route to Inova Fairfax Hospital. Nurses there cleaned her urine covered body while doctors put her on life support. Her life support system was removed Sunday and she was declared dead. McKenna’s death raises questions that need to be answered. Why did she languish in jail for one week waiting for Alexandria to come get her? What mental health services did she receive while in jail? Why wasn’t she sent to Western or Central State Hospital when jail officials saw how sick she was? Why was it necessary for a SERT team to be sent to transport her? Why did a deputy strike her during an altercation before the Tuesday incident? What specialized training do deputies working with the mentally ill in Fairfax have? Should officers Taser someone repeatedly? McKenna’s death should never have happened. It is not illegal to become mentally ill and you shouldn’t die in the custody of law enforcement because you are mentally ill.
Alexandria and Fairfax County police departments both have implemented Crisis Intervention Team Training, although Fairfax has not made it a priority. CIT officers are trained to identify individuals who are experiencing psychiatric trauma and divert them to a community treatment center or emergency room, not the jail. When Sheriff Stacey Kincaid was first elected, she was approached about having her deputies in the jail undergo CIT training. That has not been done. On a recent day, the jail held an average of 300 inmates with severe mental illnesses out of a population of 1,248. Shouldn’t deputies be trained in how to deal with psychotic prisoners? 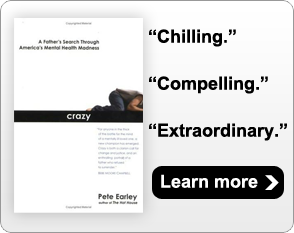 I spent ten months in the Miami Dade County jail for my book: CRAZY: A Father’s Journey Through America’s Mental Health Madness, chronicling how prisoners with mental illness were being abused there. They were kept naked in overcrowded cells. Some were physically beaten by correctional officers when they didn’t comply. The conditions reported in my book so outraged and disgusted Florida officials that they recently shut down the cellblocks in that old jail where psychotic prisoners were being abused and housed. Sadly, I didn’t need to go to Florida to expose abuses. I could have stayed in Fairfax County where I live. Based on the sanitized press release issued by the Sheriff’s Department and the foot-dragging by the Fairfax police in releasing information about the shooting death of John Geer, the Fairfax County Police should not be investigating Natasha McKenna’s death. Fairfax has a problem with how it deals with persons with mental illnesses. My own son was shot with a Taser by the police. CIT training, jail diversion and mental health courts all can help prevent senseless deaths such as Natasha McKenna’s. If our elected officials continue to refuse to deal with this issue, then it is time for the Justice Department to take a look at practices inside the Fairfax County Adult Correctional Facility.